Our Nov 19 forum tackled some of the most difficult issues which are emerging out of the ongoing transformation to digital technology. Links to presentations and videos are within the agenda below. Companies are finding they don't have the organisational capabilities they need, their data lakes are not giving the ROI they expected, their production analytics systems are making it hard to get value, their migration to cloud data storage is providing tough. 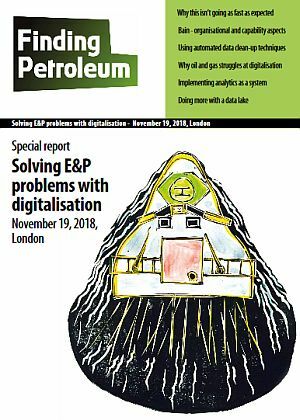 ORGANISATIONAL DIGITAL CAPABILITY - The organisational capability implications of digital for E&P companies - how should you change your organisations and develop your capability to get most value out of it? DATA LAKES - lots of companies have invested in data lakes but are they getting the return on investment they expected - and how can the situation be improved? How do you make sure you understand why the system is telling you what it is telling you? CLOUD BASED DATA MANAGEMENT - everybody wants to do it - how do you make sure it works well? ANALYTICS ON PRODUCTION DATA - every oil company likes the idea of using analytics to work out how to improve production - what is the best way to start a project to get the best results? Peter Parry is a partner in Bain & Company’s London office and a leader in the firm's Global Oil & Gas practice. He has extensive experience in strategy development, technology management, operations and commercial negotiation. He has worked extensively with the energy industry’s leading players over the past 28 years, including international majors, national oil companies, independent oil, and oilfield and engineering service companies. Peter has a particular interest in strategies for corporate growth and shareholder return performance. He has extensive experience working alongside executive management in the oil majors and national oil companies, developing and implementing growth strategies. He has assisted companies to develop technology portfolio management strategies and long-term technology investment plans, and to more closely integrate technical service activities, R&D, and field operations. He has also played high-profile roles in the World Economic Forum and with the Global Business Coalition on HIV/AIDS, TB and Malaria. He has written and published a number of articles and papers on the oil and gas sector, on the low carbon agenda and on the effectiveness of public/private partnerships. Prior to joining Bain & Company, Peter worked for Booz Allen Hamilton where he led the global upstream oil and gas consulting business. Previous roles have included managing director of Arthur D Little’s UK consulting and R&D business, manager in the Energy Corporate Finance team of a UK merchant bank and a technical specialist for the geophysical consultancy Scott Pickford and Associates. Peter is a member of the Association of International Petroleum Negotiators and the Petroleum Exploration Society of Great Britain. Using the cloud for data storage - and doing IM on data already on the cloud - is relatively easy. But to get the most benefits you need software which can put data and digital work immediately on the cloud after it has been created. It proves to be a challenge convincing big E&P software companies to let you put data on your own cloud - when they'd rather you used THEIR cloud. Advances in AI and machine learning allow previously intractable problems to be addressed through a combination of data, intelligence and computational power. Experience has taught us that unless starting with a greenfield system, much of the effort involved with applying such techniques will be spent on dealing with the complexities of legacy data. In this talk, we will give advice on how to prepare for or avoid some of the common problems encountered when taking analytics solutions from prototype to production. Founded in 1980, Tessella is the international provider of science powered technology and consulting services. World leading organizations choose our unique blend of science, engineering and sector expertise to deliver innovative and cost-effective solutions to complex real-world commercial and technical challenges. Our people are high achievers from leading universities and are passionate about delivering value to clients. We are proud that our work makes the world a better place to live in: developing smarter drug trials; preserving the digital heritage of nations across the globe; minimizing risk in oil and gas exploration; controlling the orbit and attitude of satellites; researching fusion energy. Dave started in the oil business in 1976 as a field engineer in the Middle East. In 1982 he joined BG as a petrophysicist supporting the global exploration teams, going on to become their petroleum engineering manager. After BG there was a short period in IBM before Dave and a number of colleagues started Flare in 1998. Since then he has worked with many oil and service companies and government bodies, helping them manage a wide range of E&P information and data.